Art provides a powerful way to connect with our inner selves because it communicates through symbols, which constitute the language of the soul. This symbolic language speaks to us through art's physical qualities of color, form, composition, and medium; it also communicates through an artwork's content. In this way, form and content combine to express spiritual or mystical meaning, giving art a sense of mystery and inviting us to return again and again for contemplation. Over time, art can reward us with new insights and touch our souls through beauty of form and meaning. The Sun with its brilliant light and sometimes intense heat has offered humanity a potent symbol since ancient times. Many cultures have associated the Sun with divinity, and while some saw it as feminine, many more saw the Sun as masculine and associated its active energies with a divine male parent as well as authority, the life essence, and unity. In contrast to the cool and receptive Moon that rules the night, the hot, energetic Sun rules the day and the world of actions and objects appearing out in the open, in plain sight under clear light. In astrology, the Sun rules Leo, a fire sign renowned for its dramatic passion, regal bearing, and warm heart. Astrology sees Leo as a masculine, active sign because of its fiery nature; all fire and air signs rank as masculine, while water and earth signs make up the feminine or receptive signs. Every month, as the Sun makes its way around the zodiac, it alternates between masculine and feminine signs; just as day follows night in each 24-hour period, this monthly oscillation enables us to shift energies regularly and maintain balance in our lives between feminine and masculine, receptive and active. The Sun's bright light indicates the astrological Lion's need to shine in some way. At their best, Leos express solar characteristics via a sunny personality, generosity, and loyalty; with maturity and spiritual evolution, they radiate an inner beauty suffused with spiritual light. Like the Sun, which occupies the center or heart of our solar system, Leo is associated with life's center through its rulership of the heart, both physical and spiritual; as a result, Leos tend to interact in a personal, heartfelt manner and to give and receive love freely. This painting, Deer Skull, dates to a period in which my art focused on skulls, bones, X rays, and other somewhat macabre subject matter. It evokes both the astrological sign Leo and solar themes through its colors, form, materials, and subject. 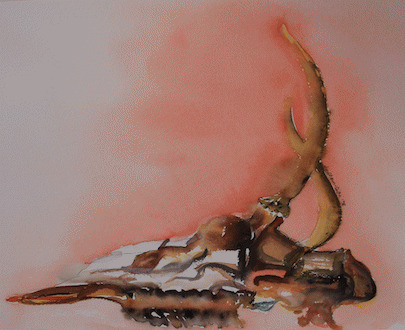 Deer Skull was created using watercolor, gouache (an opaque, water-soluble paint), and ink on brilliant white watercolor paper. This mix of media creates a blend of opposites: sharp inked lines and soft watercolor washes, white paper with dark pools of paint, and a fiery background with earthy foreground shades. For example, lines of black ink applied with a fine-tipped pen highlight details throughout the skull, such as the horns' edges and their bases, yet in the teeth at the skull's bottom center and in parts of the horns' edges, the ink ran into wet patches of paint and blended with the color to create a fuzzy look. Washy strokes of white paint in a few areas also add softness; along with the white paper, they convey the feeling of bleached bone. 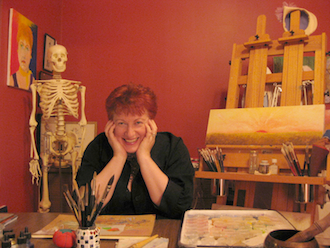 The orange wash across the background warms up the entire painting while complementing the skull's earthy tones of yellow ochre, raw and burnt sienna, and raw and burnt umber. The orange background also brings a feeling of summer's heat and intense solar power; Leo's astrological month comes during summer (in the northern hemisphere). Combined with the stark white paper and the skull, these aspects point to Leo's ruler, the Sun: a source of life-giving light and warmth, a potent purifier, and in excess a destroyer (as in a desert climate). As for the painting's subject, the skull carries associations with the head, mind, and intelligence that suggest a link with the Sun, whose symbolism includes the rational or logical aspect of intelligence (in contrast to the intuitive or super rational faculties). The head or mind focuses thought and permits insight, just as the Sun's rays symbolize the light of truth, understanding, and knowledge. In addition, the deer carries strong symbolic affinities with the Sun, a star that shines its light freely on all creation. Like the Sun, the deer symbolizes abundance, benevolence, regeneration, and generosity because it has given many cultures a source of meat as well as tools (through its bones) and clothing (through its hide). The deer and Sun also symbolize intuition or "inner knowing," for just as the deer survives by being alert and aware, so does the Sun promote knowledge by shining its light to expose truth and increase our awareness. View All 4 Articles in "Art & Astrology"